Organised excursions where you will flavour the atmosphere of Spain's Valencia province will combine fun, culture and excitement. We shall take you to places such as the ancient city of Murcia, to picturesque Alicante, the Marina at Torrevieja with its lively market and discos and maybe even Aquasplash. You will also have a shopping opportunity in the areas brand new open air shopping mall full of international brand name boutique shops. It's historic centre is one of the largest in Spain and it's heritage of ancient monuments, views and cultural attractions makes Valencia one of the country's most popular tourist destinations. Major monuments include Valencia Cathedral, the Torres de Serranos, the Torres de Quart, the Llotja de la Seda (declared a World Heritage Site by UNESCO in 1996). You will also be given the opportunity to relax, chill out and take advantage of the white sandy beaches and sea on your doorstep where optional water sports are available under strict expert supervision. 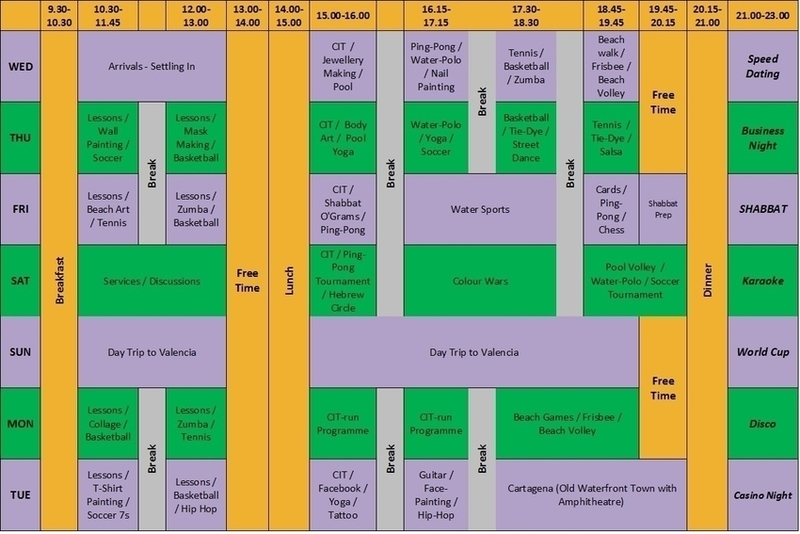 A full programme of evening entertainment to include in house discos, night time water activities and sports competitions, casino, cabaret, karaoke and BBQ's at our chiringuito bar. This will end each perfect day at Camp Espaňa. "I will never forget this Camp Espana. We had an amazing staff. I met so many people of different origins and I so happy to be friends with them now. So great I don't want to leave them now." "This camp was one of the best experiences of our lives. We made friends from all over the world and had the most amazing time together. Thank you all for this wonderful experience." "Insane camp once again. Each time better than the year before. The lessons have also improved with more excursions where we can practice our Spanish. We all feel like our language skills have improved greatly. Thank you for another amazing year." "I had a great time at Camp Espana. Met new people and learnt new things. II made very good friends around the world and did the most amazing activities. Camp Espana is a great camp and I hope to come back."